When I’m in the mood for chocolate, my easy maple chocolate fudge is my go-to chocolate treat. It’s simple, it’s silky and it’s more decadent and healthy than the powdered sugar or condensed milk fudge that I’m used to from childhood. 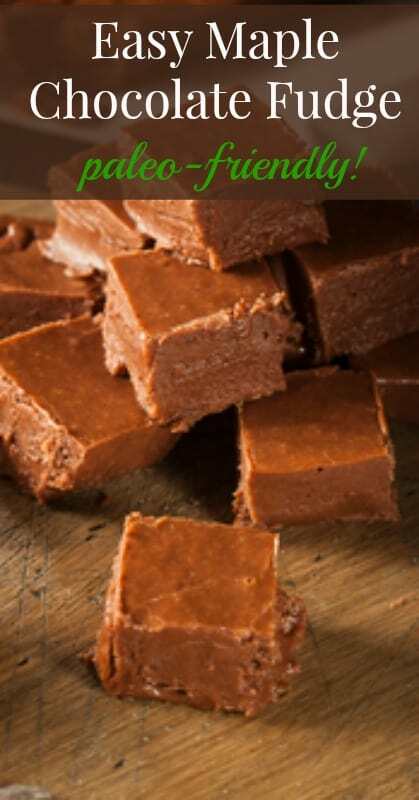 I keep a mason jar of bite-sized pieces of this fudge in the freezer at all times. When I’m hungry and I’ve had a long day and I still have to cook dinner, I pop a few pieces of this fudge in my mouth to keep me satisfied while I cook. Did I mention that this fudge is paleo and primal friendly? For paleo, just omit the butter and replace it with more coconut oil instead. No matter the sweet occasion, this fudge is perfect. In the fall the comforting flavor of maple syrup pairs well with cinnamon or pumpkin pie spice in this fudge. For the holidays and winter, crush your favorite organic candy canes and sprinkle on top or add a few drops of peppermint essential oil. For Valentine’s Day, mix dried cherries or cranberries for a fun dessert for your sweetheart. I’ve also made a layered peanut butter chocolate fudge using this recipe. No matter what you add to this easy maple chocolate fudge recipe it will truly melt in your mouth. Grease an 8X8 glass pan with butter or coconut oil. Put the ingredients into a food processor and mix together until smooth. Spread the fudge into the greased pan and place it in the freezer for about an hour. Remove from the freezer, cut into bite-sized pieces and enjoy! I store this fudge in a glass container in the freezer. Cut them pretty small and they make a perfect, pop-in-your-mouth-pick-me-up. One tiny piece is usually enough to satisfy my craving because they are super rich.